When the BBC first started broadcasting a limited television service in 1936, Shakespeare was often on the menu, to give the new medium a veneer of respectability, and to reflect the perceived tastes of those wealthy enough to afford early television sets. Between 1937 and 1939, George More O'Ferrall oversaw numerous transmissions, mostly sourced from current stage productions (for instance, a 30-minute excerpt from an Old Vic Macbeth starring Laurence Olivier and Judith Anderson ), and Dallas Bower , who would work extensively on Olivier 's Shakespeare films, oversaw a 141-minute modern dress Julius Caesar. Since they were live transmissions shown some two decades before the invention of videotape, none of them survive, and they came to an abrupt end when the BBC ceased television broadcasts with the onset of war in 1939. When transmissions resumed, the BBC regularly scheduled Shakespeare, both as individual plays (over sixty productions were shown between the end of the war and the late 1970s) and as more ambitious multi-part serials. One of the earliest, The Life and Death of Sir John Falstaff (BBC, tx. 20/1-3/3/1959) turned the Henry IV plays into seven half-hour episodes aimed at schools, while the following year saw the far more ambitious An Age of Kings (BBC, tx. 28/4-17/11/1960), which presented both the major history cycles as a fifteen-part series whose extensive cuts were compensated for by the project's overall sweep and conceptual consistency and some outstanding performances by a wide range of actors that included future stars Sean Connery and Judi Dench . Producer Peter Dews tried something similar with Spread of the Eagle (BBC, tx. 3/5-28/6/1963), a nine-part adaptation of the three Roman plays, but with less success, as the original plays did not segue together as effectively. The Wars of the Roses (BBC, tx. 8/4-22/4/1965) turned an already acclaimed Royal Shakespeare Company production into a three-part treatment of Henry VI and Richard III. Distinguished one-off productions in this period included Philip Saville 's Hamlet at Elsinore (BBC, tx. 19/4/1964), a star-studded production ( Christopher Plummer , Robert Shaw , Michael Caine , Donald Sutherland ) ambitiously shot on location at Denmark's Elsinore Castle; John Dexter 's Twelfth Night (Thames, tx. 12/7/1970) with Alec Guinness , Ralph Richardson , Joan Plowright and Tommy Steele ; an adaptation of Jonathan Miller's National Theatre production of The Merchant of Venice (ATV, tx. 10/2/1974) with Laurence Olivier and Joan Plowright ; and three Trevor Nunn RSC productions: Antony and Cleopatra (ATV, tx. 28/7/1974), The Comedy of Errors (ATV, tx. 18/4/1978) and Macbeth (Thames, tx. 4/1/1979) with Ian McKellen and Judi Dench . All three were considered unusually effective demonstrations of how to bring the theatre to the small screen, with Macbeth singled out for particular praise. But the single most ambitious attempt at bringing Shakespeare to the small screen was the BBC Television Shakespeare project (1978-85). The brainchild of Cedric Messina , who had already produced several one-off Shakespeare broadcasts, the aim was to present all the plays in productions specifically conceived for television. These garnered mixed reactions, with many of the early productions in particular being criticised both for bland interpretations and lacklustre production values, but Messina 's gamble paid off financially: thanks at least partially to the then-new medium of video, the entire project had broken even by 1982. Artistically, things improved somewhat when Jonathan Miller took over as producer in 1980, both visually (thanks to an overall design policy of sourcing sets and costumes from great paintings of the era in which the play was set, usually Elizabethan or Jacobean) and in terms of direction and casting, in some cases using well-known actors with little or no Shakespeare experience ( John Cleese as Petruchio, Bob Hoskins as Iago). Under the series' final producer, Shaun Sutton , the treatments became still more stylised and arguably more imaginative. Above all, the series provided millions of people with the opportunity to see rarely-performed plays - and it was those which generally became the most critically lauded productions. One play that certainly wasn't rarely performed was King Lear - within months of the BBC 's effort (starring Michael Hordern , tx. 19/9/1982), Granada unveiled its own version (tx. 4/1983) with a stellar cast, most notably Laurence Olivier giving what was accurately predicted to be his final screen Shakespeare performance in the title role. More recently, there have been a number of striking television Shakespeares included in the BBC 's Performance series (1994-98), including adaptations of the National Theatre productions of Richard II (tx. 22/3/1997, with Fiona Shaw) and King Lear (tx. 21/3/1998, with Ian Holm) a made-for-television compression of both Henry IV plays into a single three-hour drama (BBC, tx. 28/10/1995), and a sci-fi influenced Measure for Measure (BBC, tx. 5/11/1994). 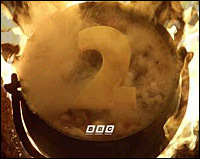 The season also included the second series of Shakespeare - The Animated Tales , an ongoing collaboration between BBC Wales and the Russian Soyuzmultfilm studio, and consisted of half-hour truncations of the major plays, the general consensus being that many of them were unexpectedly effective at capturing the essence of the originals. The first series (tx. 9/11-14/12/1992) presented A Midsummer Night's Dream , The Tempest , Macbeth , Romeo and Juliet , Hamlet , and Twelfth Night , the second (tx. 2/11-14/12/1994) comprised Richard III , The Taming of the Shrew , As You Like It , Julius Caesar , The Winter's Tale and Othello . As with British cinema, television has given surprisingly little thought to modern updates of Shakespeare plays. Penny Woolcock 's Macbeth on the Estate (BBC, tx. 5/4/1997), relocated the play to a contemporary Birmingham housing estate, and Tim Supple 's Twelfth Night (Channel 4, tx. 5/5/2003) turned its protagonists into present-day asylum seekers, but each retained Shakespeare 's original text. By contrast, Heil Caesar (BBC, 12-26/11/1973), restaging Julius Caesar within a present-day dictatorship and Othello (ITV, tx. 23/12/2001), about the Metropolitan Police's first black head, were given new modern dialogue by John Bowen and Andrew Davies respectively. All four productions garnered enough critical acclaim to suggest that this is an area that could well be explored further - indeed, Othello was originally planned as one of a series of contemporary Shakespeare updates by renowned television writers.